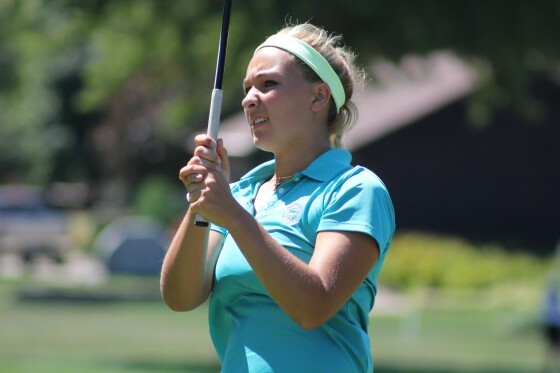 LINDEN – Dearborn’s Elayna Bowser made four birdies to fashion a back-nine 32 in a 3-under 69 Monday, and was four shots ahead of the rest of the field through the first round of the 100th Michigan Amateur Championship presented by Carl’s Golfland at Spring Meadows Country Club. Bowser was four shots better than defending champion Allyson Geer of Brighton and University of Michigan golfer Emily White of Saline, who each carded 73s. The field plays 18 more holes of stroke play Tuesday to determine the medalist/No. 1 seed and the 32 golfers for the match play bracket. Match play continues through Friday to determine a champion. Bowser had five birdies against two bogeys in her round, made the turn at 1-over and then birdied Nos. 10, 14, 17 and 18. She had a tap-in birdie on No. 10, made a 25-footer on No. 14, almost made hole-in-one on 17 and dropped a 30-footer from the fringe for birdie on No. 18. Geer, a home-schooled 17-year-old and a 36-hole medalist the last two years, said she couldn’t get putts to fall until she birdied Nos. 15 and 16 at the close of her 73. White, who will be a junior on the Michigan golf team and won her first collegiate tournament last fall, said she used driver sparingly on the tight Spring Meadows course. Setas, who will be a junior at Michigan State, said she hit just one bad drive in her 74 and hit the ball well tee to green. “The putts just wouldn’t drop,” she said.